I love popcorn. Really, it should be evident by my Kettle Corn post. Homemade popcorn on the stove just blows everything else out the window. We have one of those old fashioned stove-top poppers and it’s just awesome…..and I really mean that – not like some people say awesome but don’t really mean it. However, sometimes I want popcorn and I want it NOW. I don’t want to wait or wash the popper. Have you noticed that the good stuff at the store is expensive? But kernels aren’t? 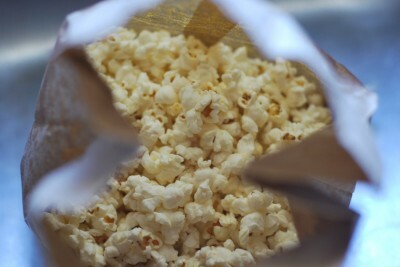 Today I’m going to show you how to make your own microwave popcorn. It’s fast, it’s easy, it’s cheap……but it’s not as good as stovetop – be on the lookout for one of those poppers at a yard sale (that’s where we scored mine!). 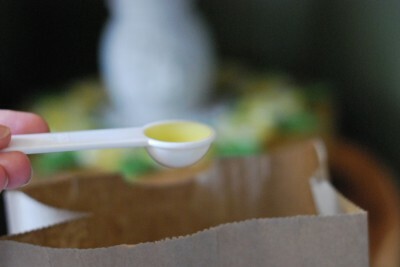 Pour the kernels right down into the bag. I’m getting really excited about what is going to happen! Pour the oil over the kernels. 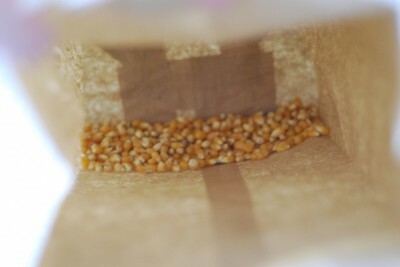 It’s a good idea to pour the oil after the kernels are already in the bag. It helps them get coated a bit better…….I learned that the hard way. I learn tons of stuff the hard way. I like my popcorn with salt. Like I said, butter is better though. 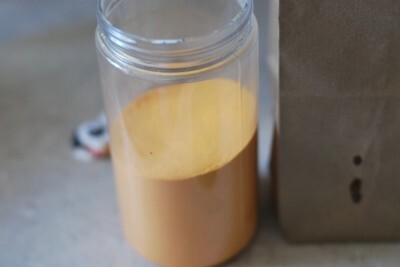 You can use popcorn salt OR any seasoning you want at this point – cumin, cinnamon, taco seasoning, ranch dressing powder, or oregano. Be creative. Have a popcorn creativity contest with your family……and then pour it out if it’s nasty and start over. Been there, done that. Now, bend the top over (not like I forgot to do in this picture) and shake the heck out of that bag. I mean, really go at it. You want to coat all the kernels with oil and salt. No kernel left behind. Now, tape the top down. I read that some people use staples…….but that just scares me a bit. I don’t want my popcorn bag on fire. 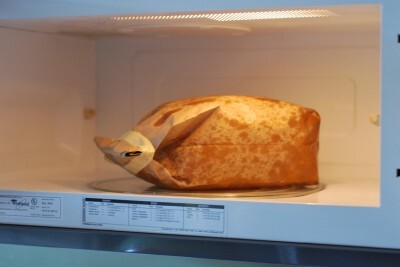 I’ve already made too many mishaps in the microwave; I really don’t need another one to add to Barry’s list. It’s a miracle! Isn’t that coolest thing ever? 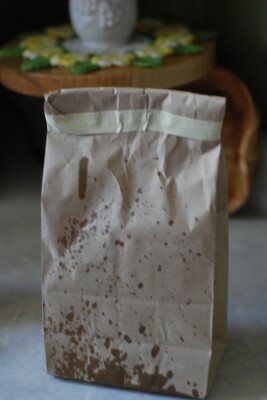 Don’t worry about the oily bag, it just wipes right up. Makes me wanna visit the Dip Dog Stand. Dig in! It’s great warm. I used this batch to make a version of Puppy Chow, but using popcorn instead of cereal. It was pretty stinking awesome if I do say so myself. It’s gone. Sorry. Make your own.This post is also linked at Tammy’s Recipes. 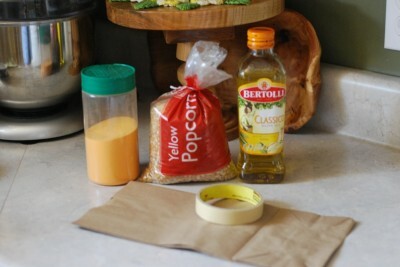 Combine popcorn, oil, and seasonings in paper bag. 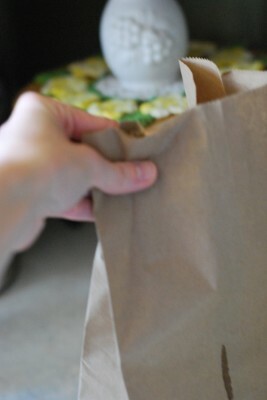 Fold over top and tape. OMG. PUPPY CHOW POPCORN? This could be epic. 🙂 It’s very good. Pass the recipe along! 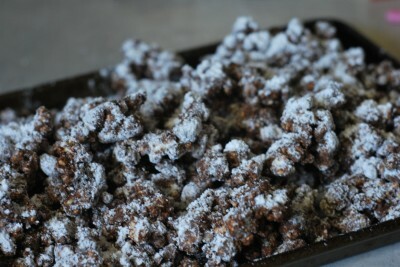 I think I’m going to make the puppy chow version this Christmas! I’ve made popcorn like this before. 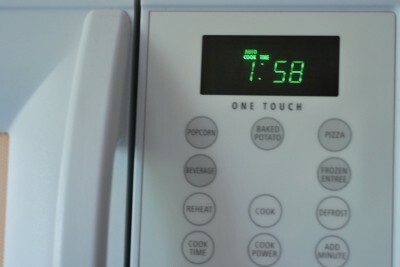 It’s fast and easy with no clean up from a pot on the stove. I love popcorn too!